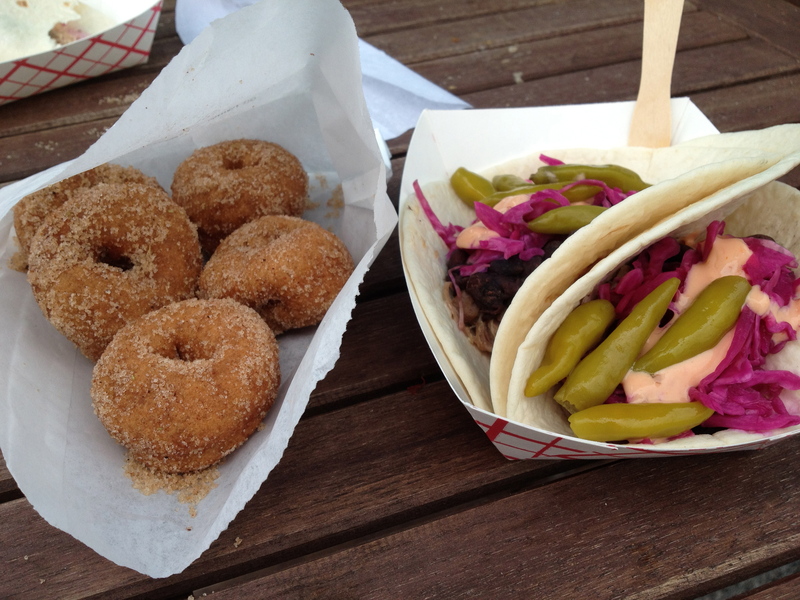 One of my favorite things to do on the weekend is to go to Fulton or Kingfield farmers’ markets (depending on the day) with Jack and Lizzie, and to make our leisurely way around the stalls and wind up at Chef Shack, one of the yummier food trucks in Minneapolis. Sometimes their mini-donuts are Indian-spiced, and go especially well with a latte. Jack’s favorite food is “purple tacos,” (his impatient pronunciation of “pulled pork” giving the dish a pretty cool moniker). My favorite items are the pickled toppings, which range from cabbage to peppers to cukes. Inspired by my new countertop appliances, the slow cooker and the food mill, (which I really didn’t need since I have a mini-chop. But the food mill’s bigger. And looks sleek. Post-consumer rationalization…) I’ve been pureeing a lot. Last night I whipped up a big batch of garlicky hummus with the chickpeas I’d simmered in the slow cooker. The meal came together around these chickpeas from various points: ground lamb I’d picked up recently and frozen, not knowing what to do with it; a selection of Mediterranean nightshades shivering and withering in the fridge (zucchini, eggplant, peppers, grape tomatoes); a craving for my favorite tahini sauce; and the inspiration of Cafe Maude‘s lamb skewers, which my family loves. I roasted the veggies with whole garlic cloves and a good glug of olive oil, grilled the lamb kebobs, and served it all with pita and fruity red wine. 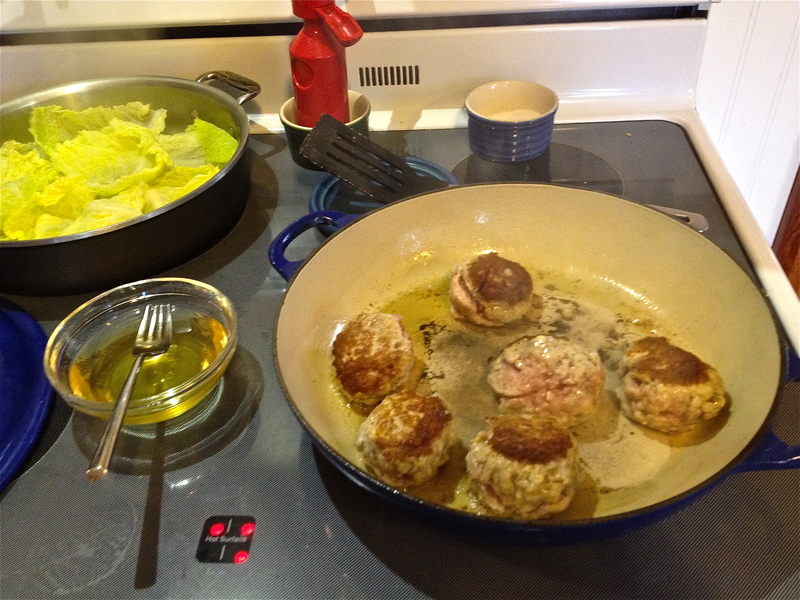 For the lamb, I basically made meatballs shaped like lozenges, combining 1 lb. of ground lamb with salt, pepper, cumin, coriander, and paprika to taste, and adding an egg and about a quarter cup of coarse bread crumbs and coarsely chopped parsley and/or cilantro. And this tahini sauce, from an old issue of Gourmet, is delicious as a condiment on so many things. Mince garlic and mash to a paste with sea salt. Whisk together with other ingredients until well combined. Serve at room temperature. Meatballs are comfort food, but they can also form the center of a sumptuous meal. Luxury and refinement meet in the meatball when it is handled with care, swaddled in a blanched leaf, braised in aromatic broth, and served in a white dish. Making these fragrant pork meatballs, delicate and gigantic at once, teaches you to handle them like egg yolks. The flavors in Lion’s Head meatballs are tame as well, in spite of their ferocious name. Ginger and warm spice, green onion, a touch of salt. My first encounter with this traditional Shanghai dish was in the now closed, but fondly remembered Fountain Court, in the Richmond district of San Francisco. Peter and I lived up the hill to the east, just past the fog line, in a one-bedroom with a sliver ocean view. We would make a long evening of it with our poet friend, starting at the Plough and Stars —empty except for us at 6:00. After getting into the groove of our usual hilarity, we’d amble down to Green Apple Books with its countless rooms of used books and music. Soon overwhelmed by the poetry, theory, novels, history, and philosophy I wanted to read, I’d find myself in cookbooks, flipping through recipes and pictures. Finally, we’d find each other and continue down Clement St. to the Fountain Court, where our friend was greeted like a long lost puppy by the owner. Because it was so good, so particular to that place and time, so perfectly accompanied by sweet roasted eggplants and a platter full of sauteed pea greens, I didn’t consider trying to make this meal for years. A decade, even. But meatballs are simple, aren’t they? They like to be cuddled and coddled like babies, and it’s hard to go wrong. So, I rounded up a recipe on Epicurious (not very scholarly, I know) and used it as an outline for my own composition, which included a dash of five spice powder—whether authentic or not. They simmered on the stove for an hour or so, becoming more tender than you can imagine meat to be. And here’s the delicious pot of mayonnaise I whisked up last week, which makes the perfect condiment for just about everything! Believe it or not, I made it the day before Melissa Clark published this mayonnaise recipe in the NYT Dining section. Must have been some kind of seasonal urge. Now, I’m a total amateur, although I did work for a moment in a restaurant kitchen where they had me prepare the béarnaise, so I know a tidbit about whisking. 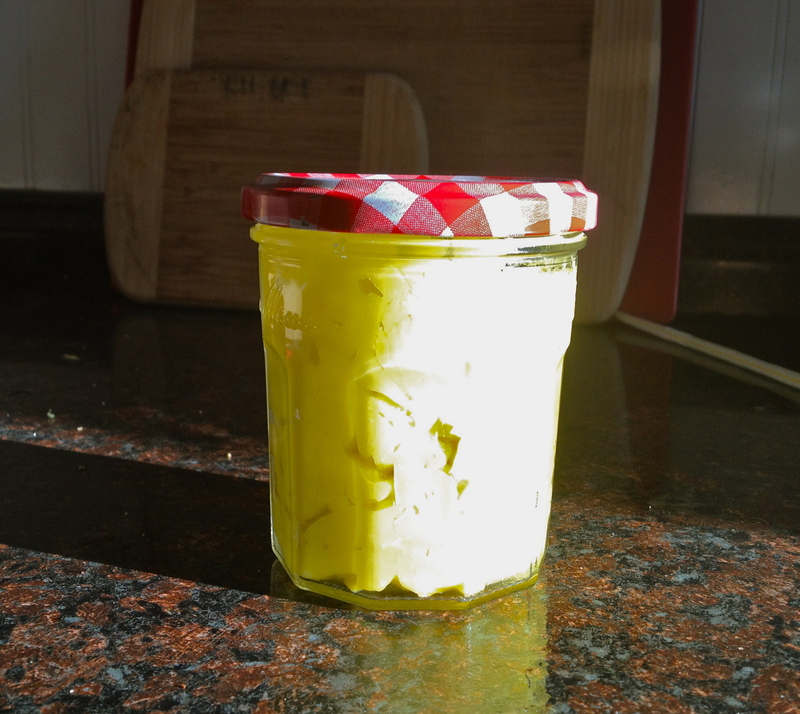 That said, I was really surprised that she didn’t know about the drops of water… In any case, homemade mayonnaise is worth every second of wrist ache it takes to make it. Lizzie’s eating solids, which is to say she’s eating highly liquefied cereal and baby food purees. 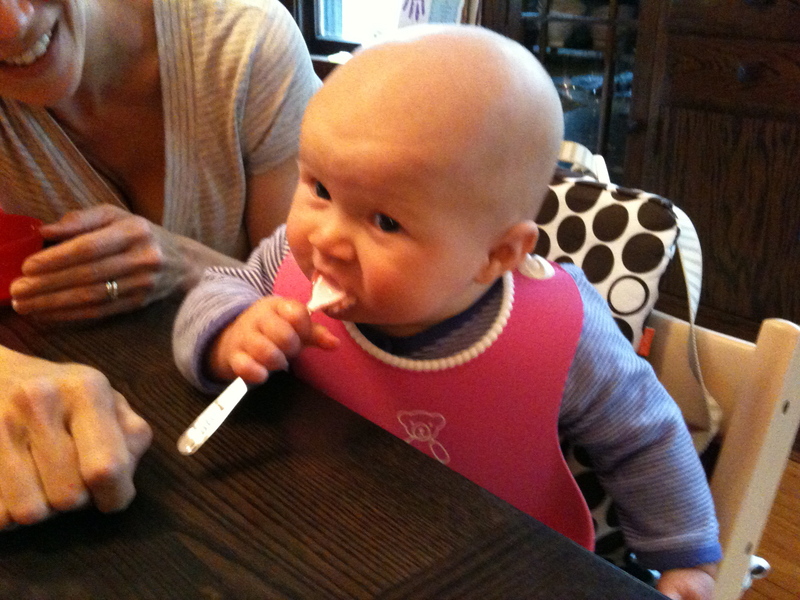 Her wrinkly-nosed reactions to some of the flavors she encounters on her spoon are quite funny (as are her grunts and screams of enthusiasm). I’m thankful for the organic security and convenience that Earth’s Best jars offer–don’t get me wrong–but that food is awfully bland. I understand that the warnings not to salt your baby’s food come from a reasonably cautionary attitude toward Americans’ tendency to excess. But other culinary tweaks can enhance flavor just as well, and can be good for both the tastebuds and the body. A dash of cinnamon, a pinch of pesto, a dribble of evoo does a body–and a food jar–good. All of us food-loving breastfeeding types also know that breastmilk is a baby’s first introduction to the flavors of her food culture. (Check out my friend Jeannie Marshall’s new book on children and food culture!) If you’ve enjoyed curries, so will your baby, the logic goes. (Why is the example always curry?) Now, when I decide to do something, I dive right in. Total immersion. (I wink to another friend.) So, in my excitement about producing lots of flavorful baby food for my little Lizziekins, I pureed a bunch of the curried lentil split- and fresh-pea soup I’d been simmering, and gave my girl a bite. Oh, it also had fresh cilantro pesto on top. Can you see where I’m going with this? Her facial expressions were… surprised, interested, quizzical, and then, upset. Why did I think going from unseasoned-rice-and-peas to curried peas would be acceptable to her tiny tongue? Ah, well… When we ate the soup later, it was good. Warm, toasty, and earthy with a bright herbal twist. Sautee the veggies in olive oil until softened, then pour in the broth, dried lentils and peas, bay leaf, and curry powder. Simmer until soft. Near the end, stir in the fresh/frozen peas. Using an immersion blender, puree part of it to thicken and smooth the soup. 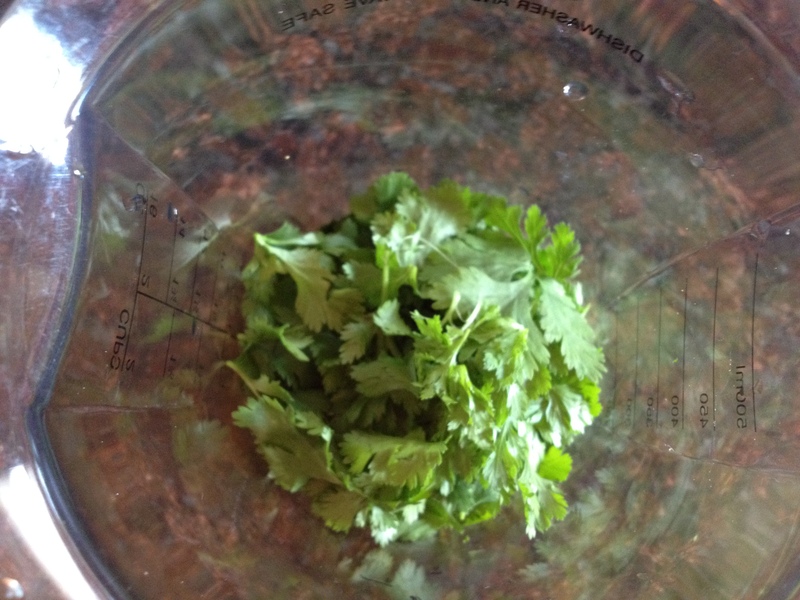 Meanwhile, make a simple pesto by blending fresh cilantro and olive oil. This is for drizzling on top. It’s hot. Eighty-six on Monday, mid-sixties overnight. Ninety tomorrow. Isn’t this Minnesota, in May? I feel like I’m back in Auburn! Meanwhile, back in Alabama, my best foodie friend Sharyn has been enjoying weather cool (80) and dry enough to ride her bike to work. Global weirding, indeed. 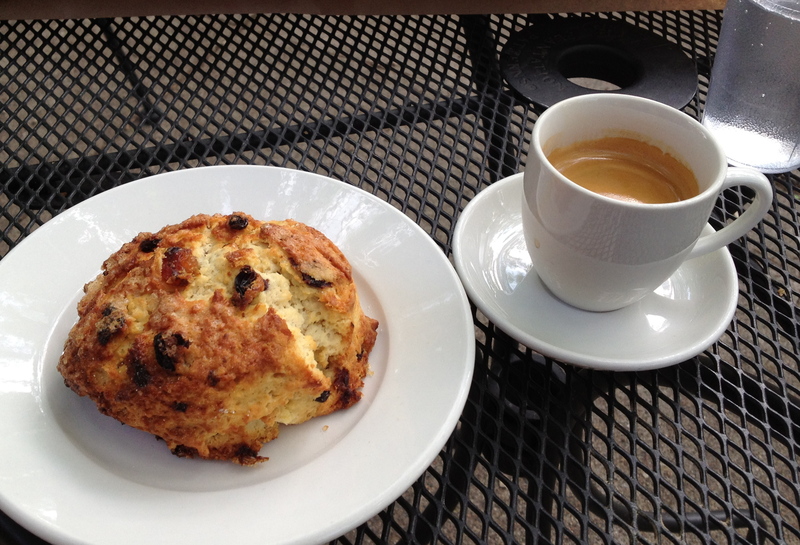 When the mornings are perfect for working outdoors, cafe-side, it’s hard to resist Patisserie 46 and their Earl Grey-infused scones. They also serve good espresso. This is an achievement, because many, many places think that squirting some thick brown stuff into a little cup counts as serving espresso, but the acidity will eat right through you. But Patisserie 46 makes good espresso (as does Urban Bean, where I’m sitting right now). Evenings are also perfect for sitting outside. Al fresco has just entered Jack’s vocabulary. It’s pretty cute hearing a seven-year-old say, “Are we going to eat our sausages al fresco?” Summery evenings put me in the mood for foods from the Solanaceae family: nightshades. Think tomatoes, peppers, and eggplants. So, when my Saveur e-newsletter arrived with a recipe for Caponata, the nightshade-rich Sicilian dish, I knew what I had to do. The secret ingredient in this preparation is unsweetened chocolate, shaved in with a fine zester. It helps to pull all of the other ingredients together, both physically and… well, tastily. 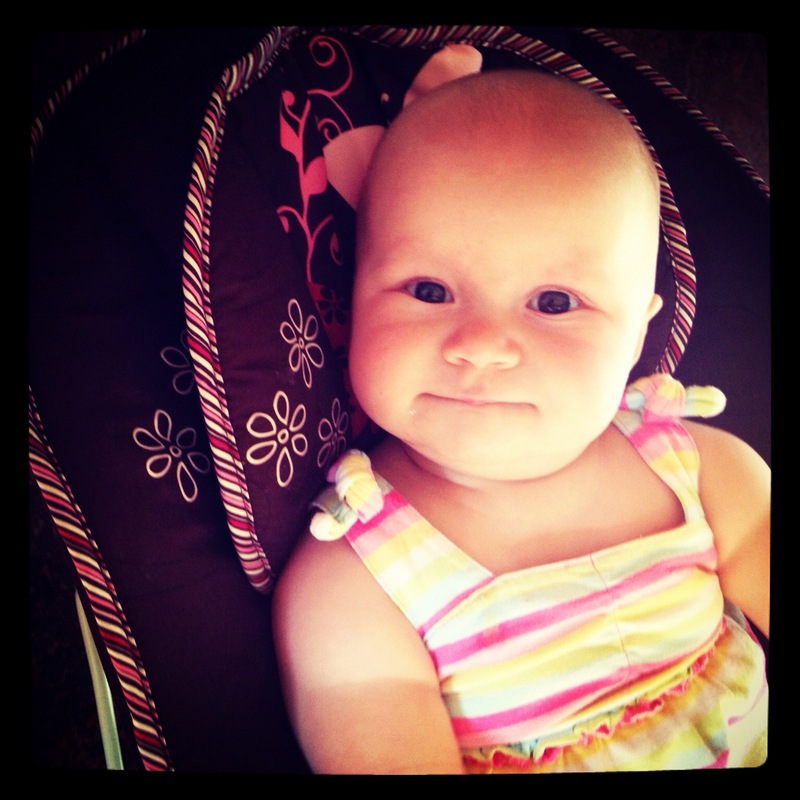 While the eggplant fried on the stove, I played around with Lizzie and Instagram. 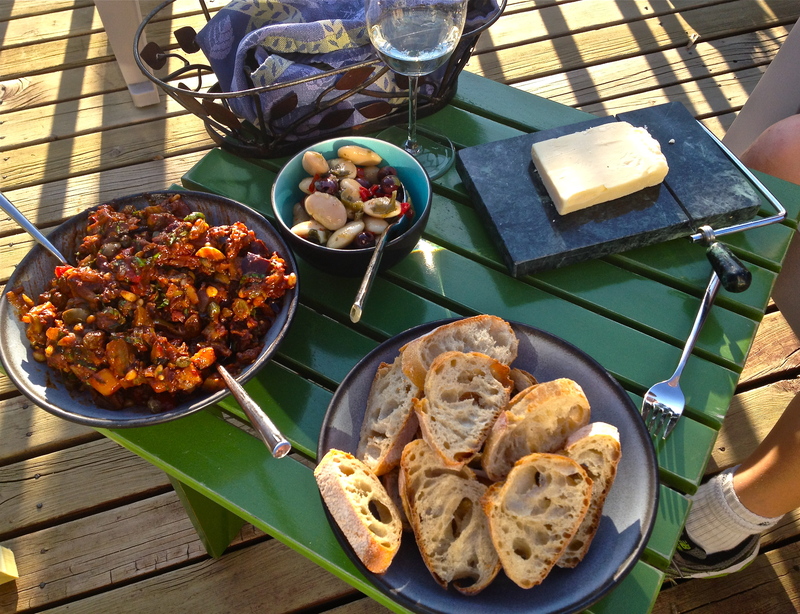 And then we enjoyed this light meal on the deck. Heat oil in a 12″ skillet over medium-high heat. 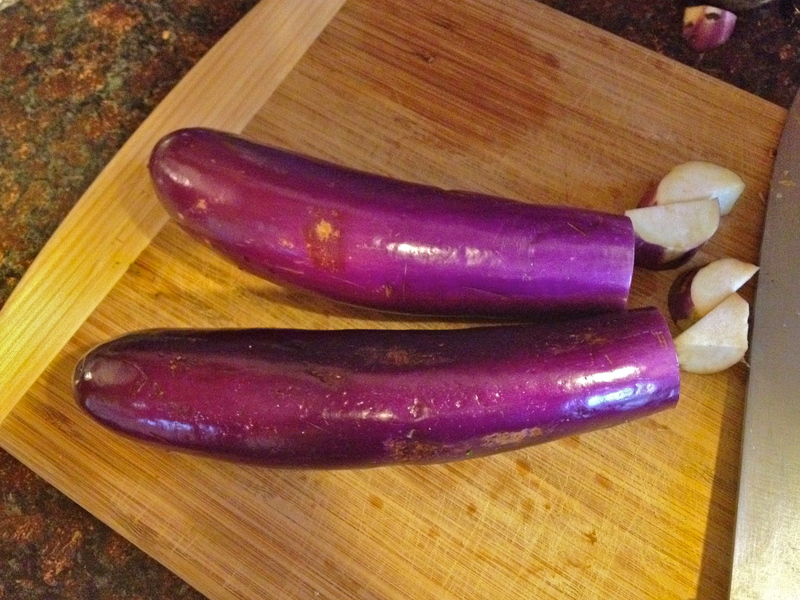 Working in batches, add eggplant and fry, tossing occasionally, until browned, 3–4 minutes. 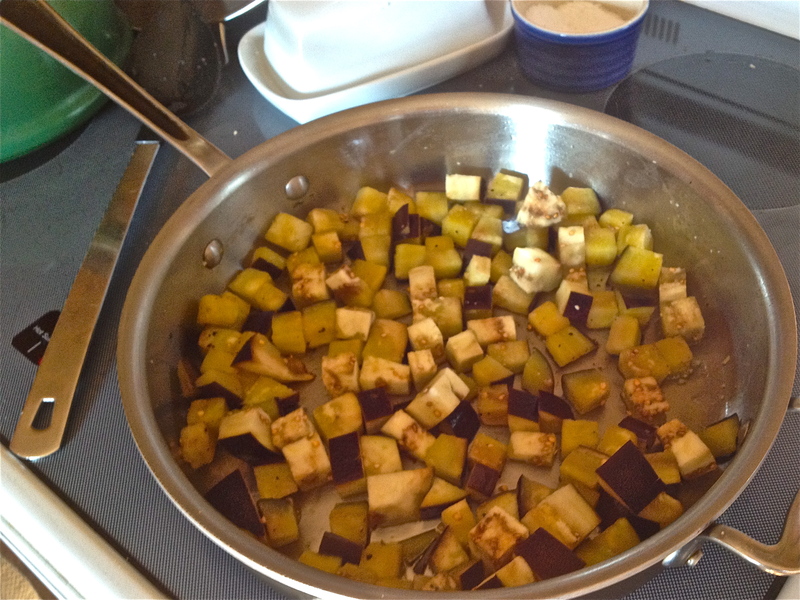 Using a slotted spoon, transfer eggplant to a large bowl; set aside. Pour off all but 1/4 cup oil, and reserve for another use. Return skillet to heat, add onions and celery, and season with salt and pepper; cook, stirring often, until beginning to brown, 10 minutes. Reduce heat to medium, and add tomato paste and cook, stirring, until caramelized and almost evaporated, 1–2 minutes. Add crushed tomatoes and continue cooking for 10 minutes. Stir in olives, vinegar, raisins, capers, sugar, and chocolate, and cook, stirring occasionally, until thickened, about 15 minutes. Transfer to bowl with eggplant, along with basil and pine nuts, and mix together. 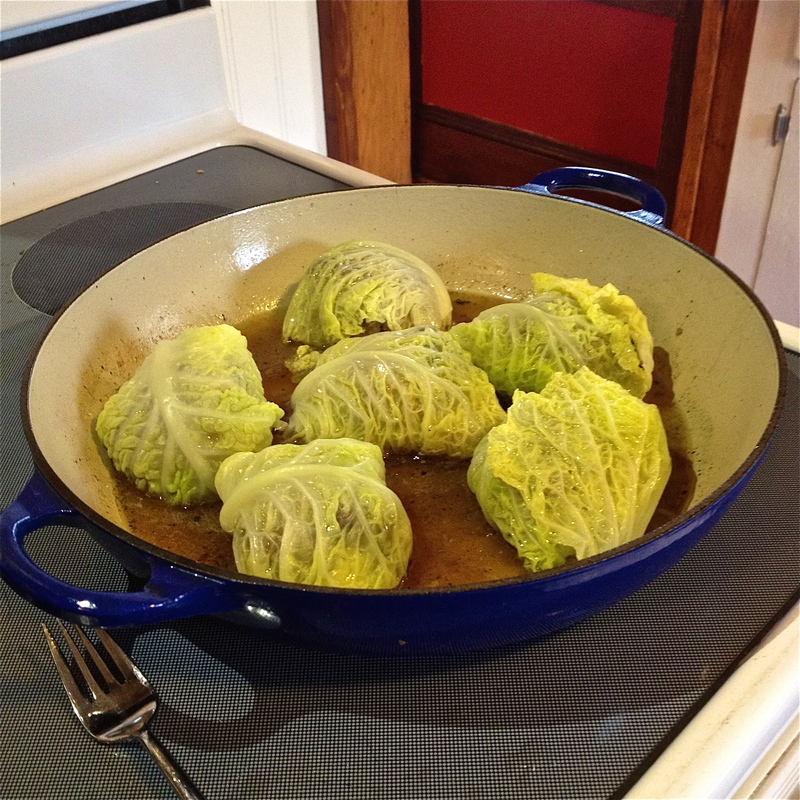 Season with salt and pepper, and let cool to room temperature before serving. 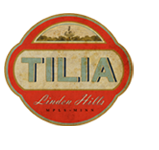 One of the best preparations of that happening ancient grain that I’ve recently experienced was Tilia‘s warm farro salad. I think it’s moved off the menu as the weather has warmed, but the memory stays with me: the bite of gorgonzola softened by sweet beets. Let me try to reconstruct it… A bed of warm farro, creamy as risotto and dressed through with melted gorgonzola, topped with a perfectly tangy salad of frisee, sprinkled with toasted hazelnuts. And then there are the chunks of yellow and magenta beets, caramelized and sweetened with roasting. I may have to try this at home. My long blogging hiatus has been filled with the flow of undocumented life: all of the usual everyday events and the everlasting universe of things. But rather than attempt a “Mont Blanc,” I’d like to be able to write a simple post in my spare moments. We have had many a good meal over the past few months, but blogging has flagged because now I have two children and two jobs. With the end of the academic semester, though, time is easing up on me, and the weather is warming up, putting me in the mood for salads. One salad in particular has caught my attention recently—a farro salad with lemon—not only because of the perfect combination of flavors—nuttiness and zest—but also because it’s linked to memories of Rome. I’ve been thinking about Rome a lot recently because I’ve been talking with two couples who will be at the American Academy starting this fall. (And on my bus ride to work, I’ve been reading Franco Mormando’s biography of Bernini, a rich and well-written book about that incredible genius who was seemingly capable of transforming marble into flesh.) I check in with Elizabeth Minchilli’s blog when an ingredient catches my eye, and this week she caught me with her minty farro salad. I made it last night, taking out the feta and serving fresh mozzarella with cherry tomatoes, generously doused in olive oil, on the side. It was a good, simple meal on a humid night. Other recent, undocumented meals have had as their inspiration sources my new slow cooker and Clancey’s Meats and Fish. 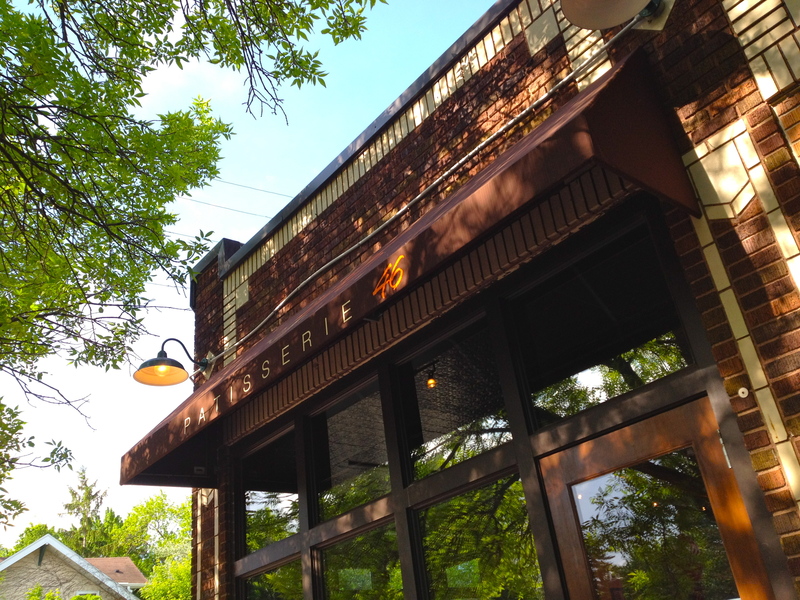 I’ve sung the praises of Clancey’s before, and I’m sure that I will continue to do so. They recently started selling mixed greens from Philadelphia Community Farm in Osceola, Wisconsin. These greens are the zingiest, most flavor-packed greens I’ve ever tasted. Every time I serve them, someone says the same thing. They’ve formed the center of meals. When we want something light and fresh, we’ll buy a bag of greens and a few other items from Clancey’s: a hunk of local cheese, a fillet of their house-smoked trout, a few local eggs, or a pint of pickled herring, add a baguette with olive oil and some wine, and enjoy a perfect meal. With my slow cooker, I’ve done pulled pork soft tacos with fresh slaw, braised lamb shanks, sesame chicken thighs served with rice and seaweed, Bolognese sauce, meatballs, and a bunch of soups. 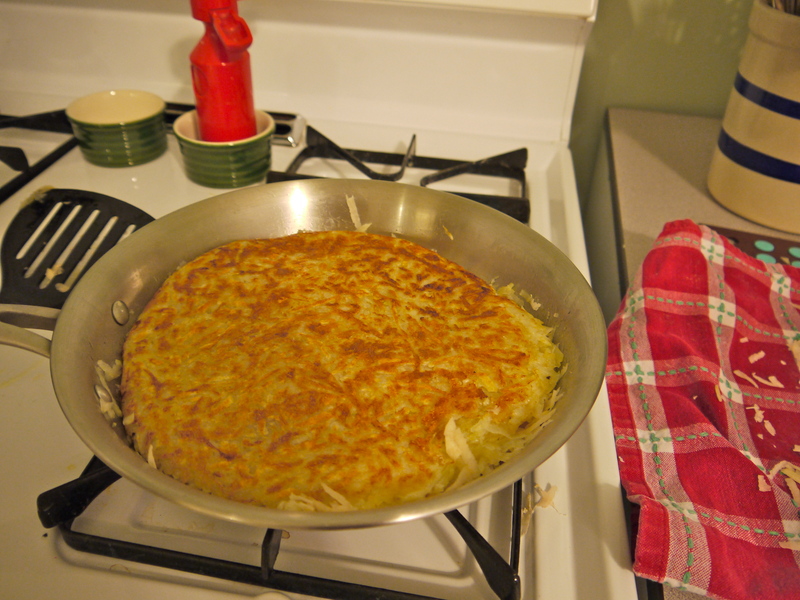 Another new easy favorite: this big potato pancake from one of the best books I’ve read lately, Maman’s Homsick Pie by chef Donia Bijan. Meanwhile, Lizzie has started eating solid food! 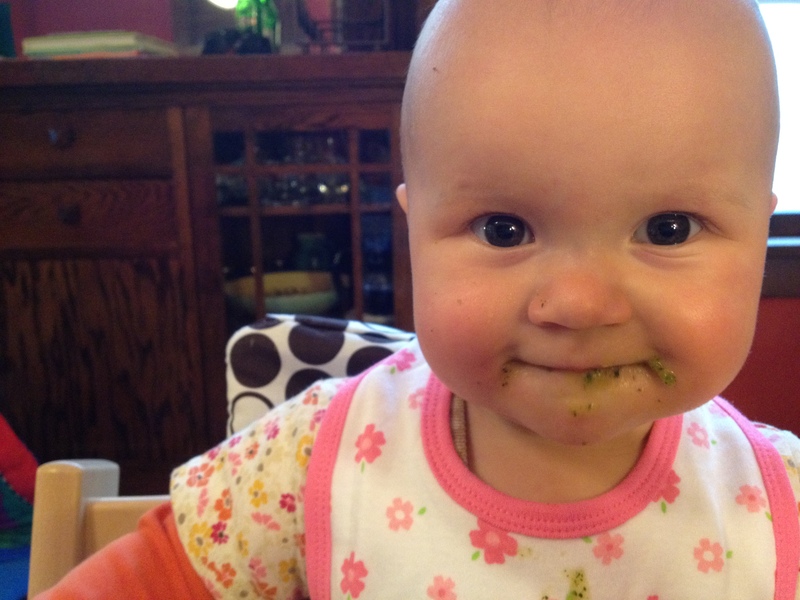 She has tried four foods to date: rice cereal, fine-milled oatmeal, carrots, and peas. One thing is clear: this girl loves to eat! Tonight, her daddy and I go on a date to the Dakota. Yippee!